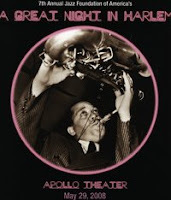 Wendy and the Jazz Foundation of America staff deserve congratulations for producing their best annual Great Night in Harlem benefit last night, based on the five of seven concerts I have attended. Not to be misinterpreted, they have always been great shows, but the Apollo Theater sound system was much more cooperative this year than in years prior. They were followed (after a brief piano solo and introduction from Chevy Chase) by Dave Brubeck’s quartet of altoist Bobby Militello, bassist Michael Moore, and drummer Randy Jones. In a true example of giving the people what they want, they played “Take Five.” If Brubeck played it say 400 times a year since recording it in the summer of 1959, this could be around the 19,200th time he has played it in performance, yet it still sounds fresh. Militello particularly tore up the solo, not at all sounding like a Desmond carbon copy. The entire quartet sounded great, and why not? Playing “Take Five” with Brubeck on the stage of the Apollo has to rank pretty high up there. The Foundation is indelibly linked to New Orleans now after all the emergency services they provided to musicians in the wake of Katrina, so there is usually a Crescent City presence at Great Night shows. Dr. Michael White’s Original Liberty Jazz Band returned this year, exploring the bawdier roots of jazz and blues with vocalist Thais Clark through the song “Horn Man Blues.” It was great fun, delivered with style, but to describe it as double entendre would suggest misleading subtlety—it is pretty straight-forward about sleeping with the band. Arguably the biggest guest star was Norah Jones, performing “The Nearness of You” backed by Buster Williams and Hank Jones, who was presented a cake for his ninetieth birthday. Actually, it would have been cool to hear that powerhouse duo take a purely instrumental turn, but the only act to get more than one number was Frank Foster’s Loud Minority, who followed Foster’s emotional thanks to the Foundation. They started with his standard “Shiny Stockings” as an instrumental showcase for guest soloists Jimmy Heath, Frank Foster, and Phil Woods, and then backed vocalist Nnenna Freelon’s “Don’t Explain.” Of course, the greatest applause probably went to Wendy on harmonica during the concluding blues jam, as it usually does.